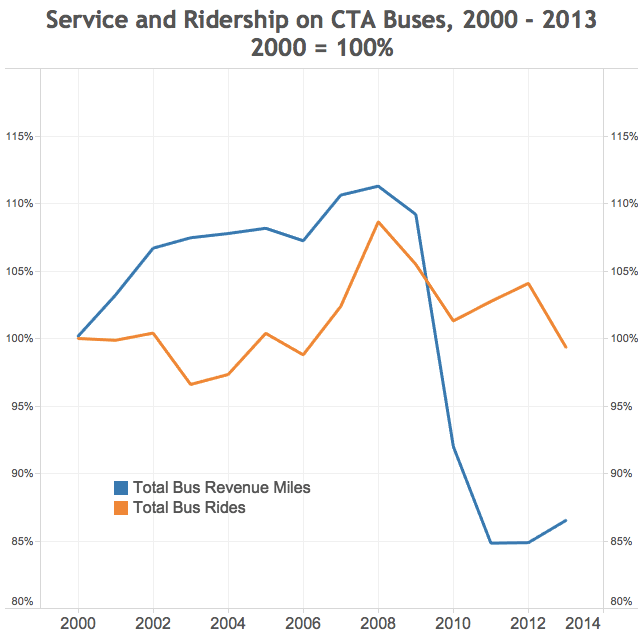 Why Is Bus Ridership Slipping in Chicago? It’s the Service, Stupid. New transit ridership figures are making the rounds, and the news out of Chicago is that bus trips declined while rail trips increased. I think any discussion of bus ridership in Chicago needs to include this chart [right], and take two things away from it. 1. First of all, declining bus ridership is not actually a “long-term” trend, though it’s often framed that way. (Or, to be more specific: decline is typical of the last 50 years, but not the last 10 or 20.) In fact, as recently as the mid-2000s, ridership was growing. And other than the deep recession years of 2009-2010, 2013-2014 represents the first multiyear ridership decline since the mid-1990s. This isn’t meant to wave the problem away: it actually makes it worse, since it suggests that far from experiencing a long, slow decline driven by structural factors, something specific has changed recently that’s made buses less attractive. I think it is also probably not a coincidence that the CTA has had a difficult time recouping its bus ridership losses from the recession, given that its dramatic recession-era service cuts have mostly remained in place. Elsewhere on the Network today: The Political Environment notes that the new budget from Wisconsin Governor Scott Walker eliminates all funding for bicycling while adding to highway debt. Streets.mn wonders what’s the best scale to assess inequality — by city, by region, or beyond? And A View from the Cycle Path explains how European cities are using smart bike lane design to eliminate the risk of dooring.